My second baby? Clamped his lips closed like it was his sole purpose in life. Then, if I did manage to get him to take it, I had about a 50% chance that he was going to actually swallow it. He was a big fan of spitting. Try tracking that dose. Then there was the vomit. Keeping a sick kiddo nourished, hydrated, and comfortable when they are vomiting is so important…but so hard. 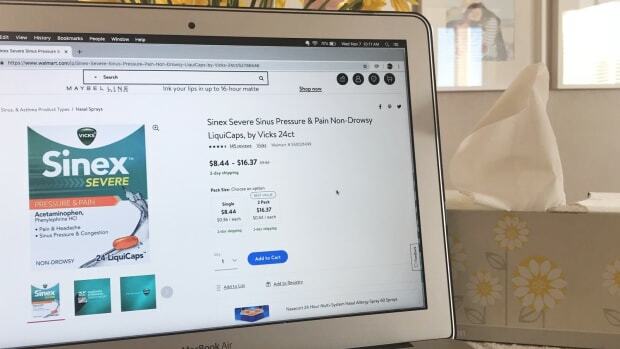 I’ve been up in the middle of the night, trying to do the mental gymnastics that require either coaxing a toddler to take something for their fever, or trying to calculate what the next dose should be…since they just emptied their stomach in their crib. I hate it when my kids are sick. I want to pause my whole life and hold them, rock them, and monitor that fever within an inch of its life. 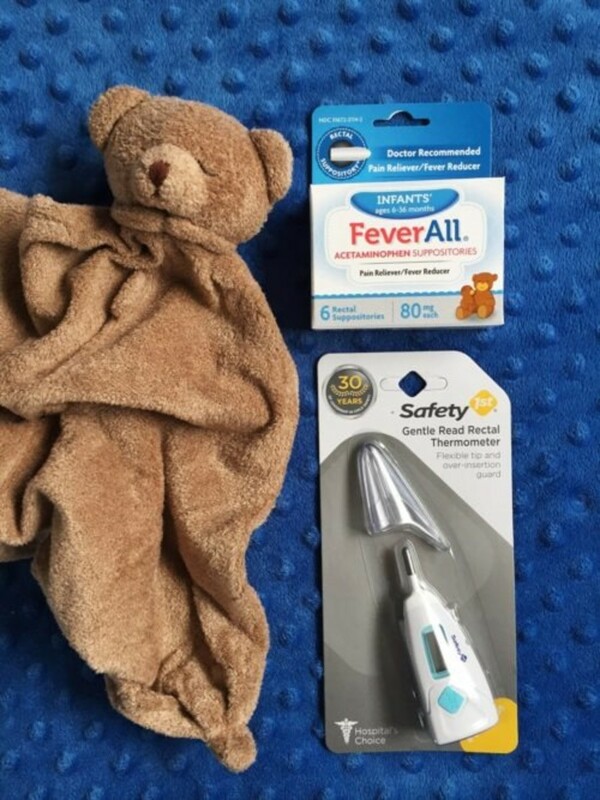 But I’ve learned that you can give yourself an advantage when it comes to cold and flu season—PREPARATION is the name of the game when it comes to caring for sick infants and kiddos. Pre-kid, I kept my house stocked with pain relievers and maybe a small box of band aids. 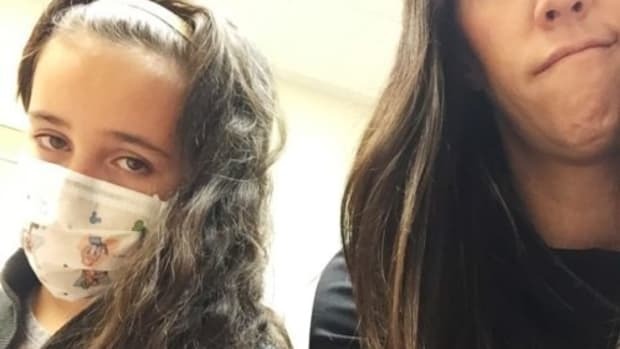 Moms of older kids and more kids will tell you that you’ll calm down about the sniffles, scrapes, and coughs—which is pretty much true. But a fever is a different ballgame for me. 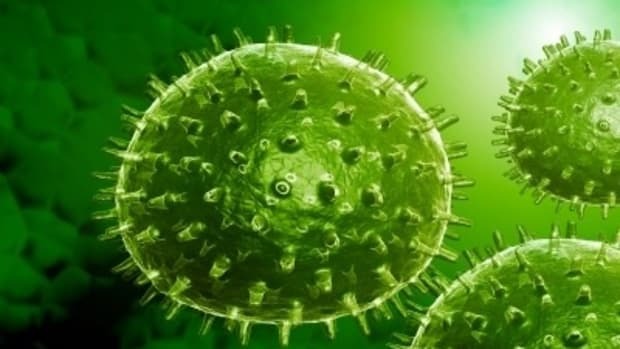 According to the American Academy of Pediatrics, fever in babies begins at 100.4 degrees Fahrenheit—and while a fever is a sign that the body is doing its job and fighting off an infection—it felt more worrisome for me as a mother of young children because they can’t really tell you much about how they feel. 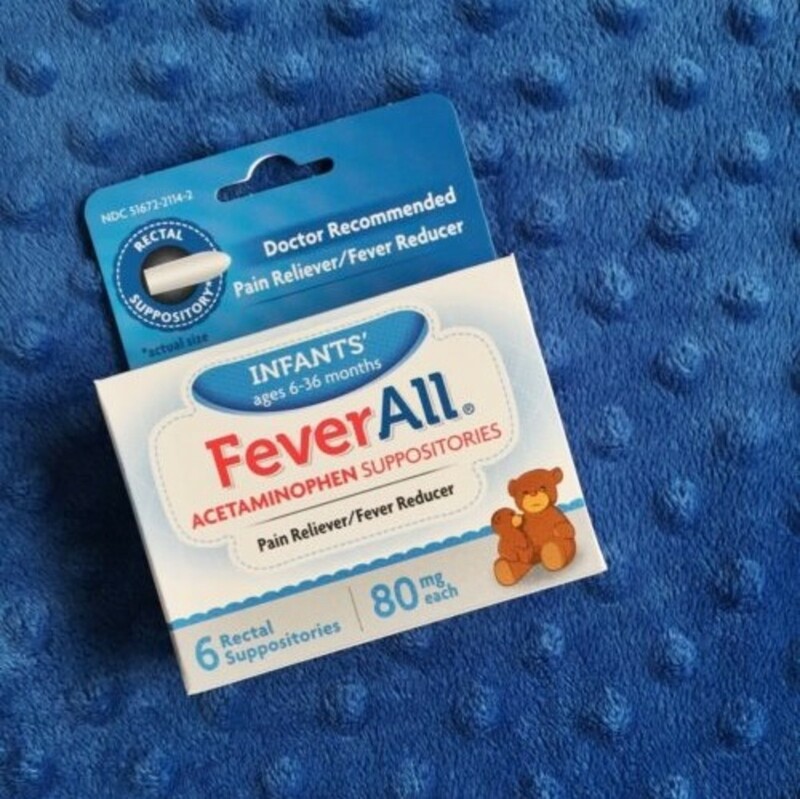 Here is something that can help bring relief — FeverAll Infants’ Acetaminophen Suppositories. 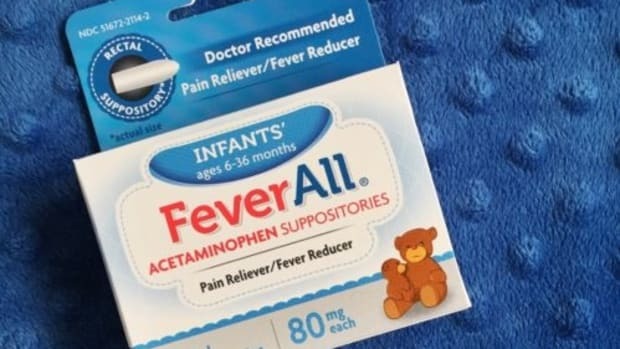 FeverAll is an acetaminophen suppository for kiddos 6 months to two years old, available in an infant strength, specifically for this tricky age group. (Remember my son, the refuser?) FeverAll is free of parabens, high fructose corn syrup, and artificial colors and preservatives—and it’s easy to find at your local Rite Aid, CVS, Walgreens, and Walmart stores. Keeping acetaminophen on hand to reduce fever is a great habit to get into—in both liquid and suppository form—so you can be ready if your child becomes too ill or too fussy to take liquid medicine to manage their fever. Caring for a runny nosed kid becomes additionally challenging as they interpret you pulling a tissue from the box as the signal to flee. Before too long, that poor kid is chapped from cheek-to-cheek from all that nose wiping. 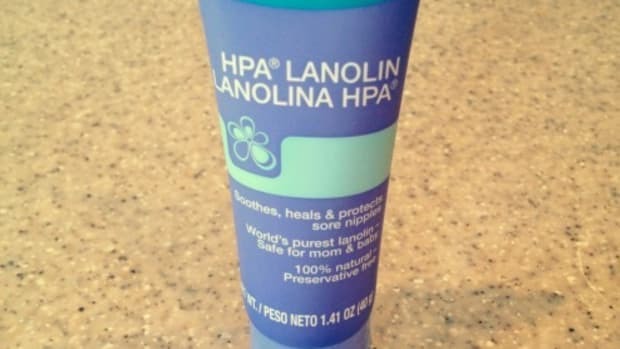 Lanolin cream (yes, the same stuff you used for nursing) does and outstanding job of healing a dry, cracked nose. Just slather it on before you put that kiddo to bed and they’ll wake up a lot less chapped. The only thing worse than discovering that your child has been sick all over their bed (and self) is realizing that you have no way to remake the bed without going into full laundry mode in the middle of the night. (My kids only seem to come down with the pukes in the dead of night. Anyone else?) It makes life much easier to be able to remake the bed quickly because you’ve got another mattress protector and sheets for that little one. Keeping kids hydrated when they are sick is so important, but my sick kiddos want nothing to do with food and drink. So I stock their very favorite drink in the fridge or pantry during cold and flu season—juice, electrolyte drinks, or popsicles. That way when they come down with something I can usually entice them to drink because I’m willing to say yes to using the big cup if it means keeping them hydrated. For more tips on caring for little ones during cold and flu season follow FeverAll on Facebook, YouTube, Instagram, and Pinterest. Keeping sick babies comfortable is a pretty daunting task.